The bot titled Cricket Bot API addresses an exhaustive set of information, from live and historical data on matches to player and team stats. Hyderabad: Do you know the batting average of Virat Kohli versus Australia in ODI? Do you know how many matches has South Africa won while playing at home? Or do you know in which match is M S Dhoni playing next? 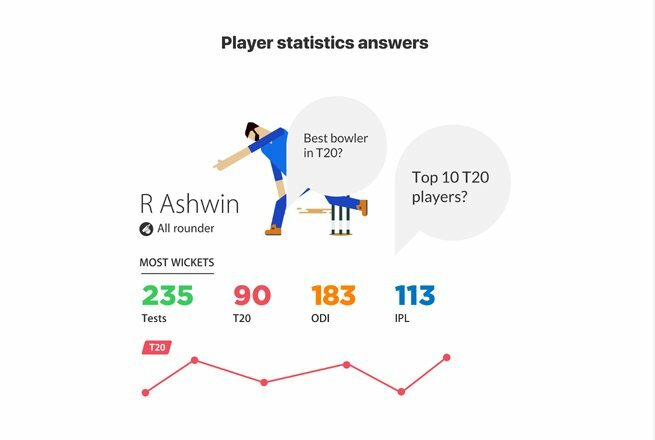 Now, you can get all cricket-related queries answered by a bot developed by Roanuz! The Chennai-based startup has developed an AI-powered virtual assistant that is programmed to give context-relevant answers to both text and voice queries. The bot titled Cricket Bot API addresses an exhaustive set of information, from live and historical data on matches to player and team stats. It covers information related to all ICC Men’s International matches from 2012, Indian Premier League, Big Bash League, Caribbean Premier League, Pakistan Premier League, Bangladesh Premier League, Ram Slam T20 Challenge, Tamil Nadu Premier League, Karnataka Premier League, Women’s T20I Tri-Series, Kenyan Premier League until date, Champions League T20 and Big Bash League to name a few. Along with this, it has also introduced Cricket Fantasy API provides up-to-date information on player value, player credit value, and player market value for the upcoming match and calculates players’ points for the live or completed matches too. The team at Roanuz has processed over 1.2 million balls (12,15,814 to be exact) until now, which means the API has been fed with approximately 5-million records as an input for the bot to answer questions related to modern-day cricket. This bot with analytical capabilities is taking around 1,500 milliseconds to respond at present, and this time is expected to dwindle to 300 milliseconds. “Having a wide coverage of relevant information, the bot has the ability to respond to different topics such as player profile, recent matches, player vs team, team vs team and live updates,” explains Anto Binish Kaspar, founder and CEO, Roanuz. The Cricket Fantasy API, on the other hand, provides easy-to-use, readymade data for developers and creators of fantasy games that can be easily integrated into their platforms. Through this API, Roanuz has unleashed unprecedented possibilities for developers of fantasy games. Both Cricket Bot API and Cricket Fantasy API are powered by extensive data gathered by Roanuz for its cricketing solutions over five-plus years.